What are conservatives freaking out about now? The latest freakout: Obama paraphrased a sentence from the Declaration of Independence which states “We hold these truths to be self-evident, that all men are created equal, that they are endowed by their Creator with certain unalienable Rights, that among these are Life, Liberty and the pursuit of Happiness.” But, left out “by their creator” (actually he left out all the words that I didn’t put in bold: “We hold these truths to be self-evident, that all men are created equal, that they are endowed by their Creator with certain unalienable Rights, that among these are Life, Liberty and the pursuit of Happiness.“). He snubbed the Christians! Obviously, he’s into Jeremiah Wright’s radical black-liberation Christianity. He’s obviously a muslim. He’s obviously an atheist. For the sake of conservative propaganda, please ignore his July 4th, 2010 (transcript) and his May 22, 2010 (transcript, video @ the 24:25 mark) speeches where he does include “endowed by their Creator”. Was the American Revolution contrary to Christian teaching? The section of the Bible pretty much outlines the divine right of kings and other rulers. Further, if God instituted the British authority over the American colonies, then not only was the American Revolution contrary to the teachings of the New Testament, but raises yet another problem for activists who want to convince us that the American government was founded on Christianity. Of course, the whole thing is self-contradictory nonsense anyway. Afterall, according to this passage, Americans were supposed to submit to the British while they were in power and not start a revolution because the British were “established by God”. But, the moment the revolution was successful (despite the Biblical teaching against revolution), then suddenly the new American government is supposedly “established by God”. This is a picture I took in my neighborhood. 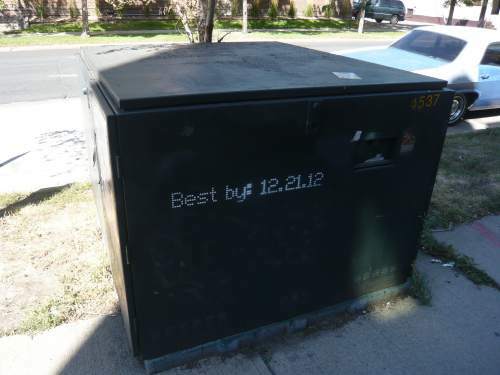 I’m not much of a fan of graffiti, but I thought this was clever.